I’m gearing up to teach project management again over the summer. There’s a notion lurking in the back of my mind that warrants development. We would do a better job at managing projects if we spent more time designing them first. Suppose our problem is to improve the way we bring new hires on board in a rapidly growing organization. There’s an obligatory amount of HR and administrative paperwork to complete, but the goal is to integrate new people into the organization. Do you send them off immediately to new assignments? Do you design a formal training program? There’s a host of questions and a host of possible ideas so you now have a potential project. Given the pressures in organization to “get on with it” the temptation is to grab a half-formed idea, sketch a a plausible plan, guess at a budget, pick a deadline, and start. If we have some project management practices and discipline, we’ll flesh out the plan and develop something that looks like a work breakdown structure and a timeline. What we don’t give sufficient attention to is the design thinking that might transform this project idea into something that might add meaningful and unexpected value to the organization. We don’t give that attention because we don’t view a project as something worthy of design. What would it mean to design a project? Two ideas come to mind. The first would be to generate ways to increase the value of the effort. In our on-boarding example, one objective was to offer new employees practice in preparing client presentations. Rather than develop a generic presentation skills module, the project team came up with a better idea. We asked teams in the field for research and competitive intelligence tasks on their to do lists and transformed those into assignments for the on-boarding program. This allowed us to accomplish the presentation skills training, contribute to actual client work, and build bridges between new employees and their future colleagues. A second design thinking aspect would be a more deliberate focus on generating multiple concepts and approaches that would evolve into a work breakdown structure. My conjecture is that more projects are closer to one-off efforts than to executing the nth iteration of a programming or consulting project. Project management personalities are tempted to standardize and control prematurely. But standard work plans and templates aren’t relevant until there are enough projects of a certain category to warrant the investment. 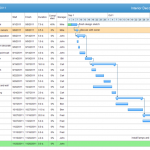 Doing this kind of design work calls for expanding the toolset beyond the conventional project management toolkit that is focused on tracking and monitoring the sequence of tasks. Is making a distinction between project design and project execution worth the trouble? How do standard project management tools—Gantt charts, project management software such as Microsoft Project or Primavera, or spreadsheets—interfere with early stage idea generation and creativity? How might you/do you expand the toolset to support better design thinking?